Self-Therapy brought Internal Family Systems Therapy to both therapists and the general public. It shows how working with parts can be user-friendly, respectful, and powerful. Self-Therapy, Vol. 2 takes the next step by describing advanced IFS techniques and insights related to staying in your true Self and working with protectors (defenses). If you have been using IFS with your clients or in your own inner work, this book will help you work through difficulties that may have arisen so your work can be even more healing and transformative. Learn when to switch parts, how to track your work, negotiate for Self-leadership, and work with polarization, Self-like parts, managers, and firefighters. The many readers of Jay Earley’s Self-Therapy, Vol. 1, who have been helped to work with their inner systems by receiving the fundamentals of the IFS Model, will be pleased to find that Self-Therapy Vol. 2 offers them guidance for the inevitable challenges of our complex inner worlds. Our protective systems form an intricate and veiled web of alliances and polarizations that can confound you traversing your inner landscape alone. This indispensable companion to the first volume systematically guides you to identify, track, negotiate with, and transform these devoted and persistent protectors to bring more Self leadership, harmony, and peace to your inner world. I appreciate Jay’s thorough and methodical approach, enhanced by experiential exercises, case examples, special notes to the therapist, and Help Sheets. As an IFS trainer for 20 years, I recommend this book not only for those wanting to work on their own or with a peer, but also for students, graduates, and trainers of IFS. Self-Therapy, Vol. 2 is the exciting new sequel to Self-Therapy. It is an indispensable guide for anyone on the journey of mindful self-discovery, understanding, and empowerment. Written for both the professional and the layperson, it delivers a fresh, “must-have” resource for the IFS model. Earley, in his surprisingly easy writing style, turns up the excitement by illuminating “hidden in plain sight” patterns, and masterfully mapping the steps that turn treatment roadblocks into bridges! As intrigued as you will be to dig into all these fascinating parts-work innovations, rest assured that Jay Earley remains true to his signature style of supporting his readers by including powerful examples, step-by-step instructions, and worksheets. This is the book to take your IFS practice to the next level. 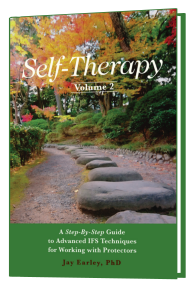 The first volume of Self Therapy provided a practical description of the IFS model of psychotherapy that helped many people explore and transform their inner worlds on their own. But one book cannot adequately cover the many IFS concepts and methods I developed the past 30 years, hence Volume 2. In it you will find clear and practical descriptions of important concepts like polarization among parts and how to depolarize them, Self-like parts and how to detect them, and tips for maintaining and deepening the work.